Thomas Arvid possesses an unerring ability to refine a moment. In doing so he captures our wonder and has become an art world phenomenon. 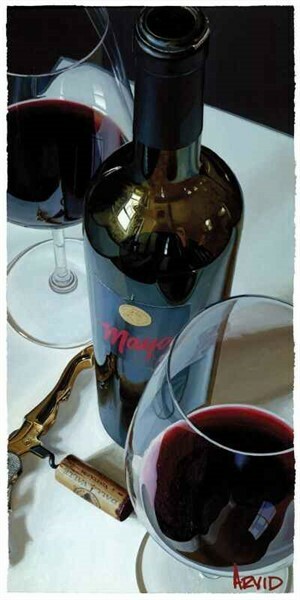 Art Business News (May 2003) credits him with “launching a major art trend…” with his oversized still life compositions of wine and the rituals surrounding its consumption. Arvid’s images astound viewers with their intricate details and his mastery of light, depth and reflection. The magic of his painting is in Thomas Arvid’s ability to visualize and chronicle an entire scene beyond the frame – to tell a story of enjoyment and the good life – using lush color and adroit composition. Thomas Arvid is passionate about art and wine, a collector of both, he strives to capture the pleasure of a life well lived on each canvas. An Atlanta resident and fresh-faced father of two toddlers, the self-taught artist insists that wine should be approachable; his paintings are an embodiment of the casual way that we enjoy wine today. He is an appealing role model for a lifestyle of easy elegance and unpretentious charm. The aura surrounding Arvid’s work is palpable. His international appeal has created such demand that his work is represented by over 50 elite art galleries in the US, Canada, and Japan, and collectors are willing to wait years for one of his originals. Influential wineries such as Silver Oak Cellars, and Diamond Creek Winery collect Arvids because he translates the craftsmanship of wine to canvas. Thomas Arvid possesses an unerring ability to refine a moment. In doing so he captures our wonder and has become an art world phenomenon. Art Business News (May 2003) credits him with “launching a major art trend…” with his oversized still life compositions of wine and the rituals surrounding its consumption. Arvid’s images astound viewers with their intricate details and his mastery of light, depth and reflection. The magic of his painting is in Thomas Arvid’s ability to visualize and chronicle an entire scene beyond the frame – to tell a story of enjoyment and the good life – using lush color and adroit composition. 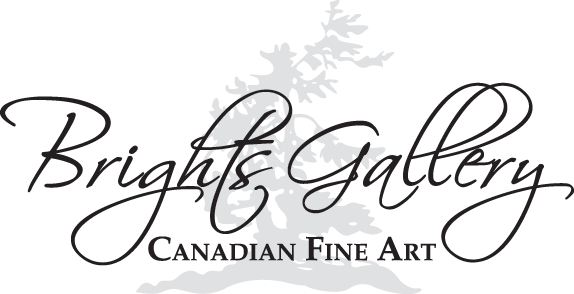 Thomas Arvid is passionate about art and wine, a collector of both, he strives to capture the pleasure of a life well lived on each canvas. An Atlanta resident and fresh-faced father of two toddlers, the self-taught artist insists that wine should be approachable; his paintings are an embodiment of the casual way that we enjoy wine today. He is an appealing role model for a lifestyle of easy elegance and unpretentious charm. The aura surrounding Arvid’s work is palpable. His international appeal has created such demand that his work is represented by over 50 elite art galleries in the US, Canada, and Japan, and collectors are willing to wait years for one of his originals. 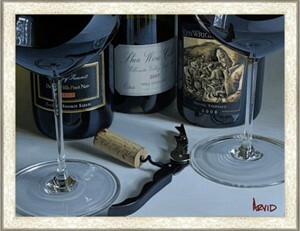 Influential wineries such as Silver Oak Cellars, and Diamond Creek Winery collect Arvids because he translates the craftsmanship of wine to canvas.